Will the Thrill: The first zombie musical was the late Ray Dennis Steckler’s The Incredibly Strange Creatures Who Stopped Living and Became Mixed-Up Zombies (1963), though that was not a musical in the traditional sense, like yours, which is more like a rock opera. What was the initial inspiration for Song of the Dead? CG: I have always loved music and film. I love when the two meet and actors break out into song and dance to help tell a story. I was a big fan of music videos when they came out on TV in the early 80’s. The musical genre, both stage and film, has been one of my favorites. I am especially captivated by the few horror musicals. I grew up with The Rocky Horror Picture Show, of course. But I would not call that the initial inspiration for Song of the Dead (SOTD). What made me want to write SOTD was how the U.S. government and media were responding terrorism after the tragedies of 9/11. The response was a grand theater that made everyone scared. I thought that it was time to make a zombie film that reflected this new era of nameless, faceless terrorists. With all of the media drama, the musical aspect was the next logical step. The producer-editor of SOTD Bob Swope and I started with a short film that we shot as a sample for investors. Fangoria Magazine helped to launch the film by releasing the short as part of their first Blood Drive DVD. The Blood Drive DVD was released in 2004 and was hosted by musician/director Rob Zombie. We got a very positive public response from the Blood Drive piece. This was the break we needed to get investors on board. As soon as we were able to secure funding, we got started with the feature. We are very grateful to Fangoria magazine for the publicity they gave us. We would have been hard pressed to make this film without their help. Thrill: You also co-directed the excellent new Lucha film, Mil Mascaras vs. the Aztec Mummy, also released by Monogram (April 24). How (and why) you were exposed and attracted to the world of underground cult cinema? CG: Underground cult cinema is the best! As a kid I would search out the strangest movies to watch. These movies had a way of expanding the imagination while making you laugh, cry, and cringe at the same time. They depart from the formulas of most Hollywood films. Normal rules do not apply to cult films. These films inspired me to become a film director. It was only natural for me to start directing films that included iconic cult figures like zombies and Luchadores. 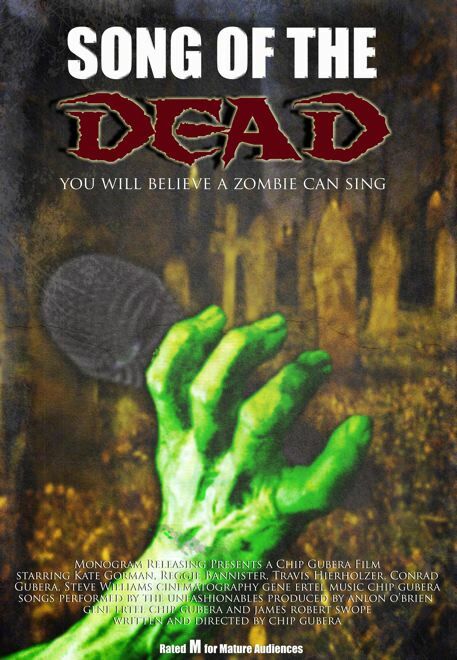 Thrill: How difficult was it to cast a film in which people had to both fight off zombies and sing, often at the same time? CG: It was hard. During the auditions we had a karaoke machine so that we could hear people sing. It was like a low-budget American Idol. We were lucky to get a great cast. We did have two casting problems. The first involved casting an aging rock star (I won’t give the name) to play the part of the President. We put down 20% towards his contract and were ready to go. We started shooting and he dropped out. We were left without a President. Bob Swope called Tony Timpone, editor of Fangoria Magazine, and asked for his advice. In fact, he asked if he would like the part. He laughed, but suggested horror-great Reggie Bannister. Turns out, Reggie is a rock star himself. He has his own band rock band called the Reggie Bannister Band. He read the script and called it a future cult classic. We got lucky to cast Reggie. He is a great guy, a talented actor, and a real professional. The second casting issue involved our lead actress Kate Gorman. Kate was originally our script supervisor. On the first day of principal photography, our lead actress dropped out. When she left, we had already done over a month of preproduction that included the recording of the musical soundtrack. We were all sunk and thought that we would have to put off production. Steve Andsager, the guy who played Arthur Bundy, suggested Kate take over the lead actress role. It turned out that Kate had a degree in theater. We shot around her the first few days so she could learn lines and get a character. Then we got her into the studio, I worked with her as much as possible, and the costume designer altered the wardrobe. A few days later she showed up on set and nailed the part. Thrill: Unlike a George Romero zombie film, the politics of Song of the Dead seems deliberately ambiguous (both right and left wings get fried). Was it your intention to both parody and pay tribute to the social satire of Romero? CG: I respect Romero’s vision. He defined the genre. Without him, there would be no zombie movies today. The brilliance of Romero was that he let contemporary politics play a crucial role in his storytelling. That is what I did with Song of the Dead. In the U.S. we have two main political parties. After 9/11 both parties worked together as one against the threat of terrorists. President Bush wielded his power and made some aggressive decisions in what he thought was in the interest of protecting the nation. Soon after, the two parties started to polarize over the decisions of the President. The debate got ugly and it seemed like the media were driving scare campaigns against right and left wing ideas. Most of the U.S. strongly supported one side or the other. People became zombie-like, blindly following either the left or the right. It was this strong polarization that inspired the politics in SOTD. SOTD is a social satire of the political climate of the early 2000’s. Like Romero, I let the politics of the time tell the story. Thrill: What’s next for you, film-wise – how do you follow up a zombie musical and a lucha monster movie?? CG: I directed another Lucha film starring Mil Mascaras called Academy of Doom. It is about werewolves, stolen brains, and a women’s wrestling academy. This film should be released soon. I also produced a horror anthology called English: 301. In that film there is a slasher-musical segment that I wrote. This film is in postproduction. Both films were produced at the University of Missouri-Columbia’s IT Program where I am a Resident Instructor. Bob Swope is also a Resident Instructor. He also produced and edited Academy of Doom. The IT Program has an Entertainment Media track in which students learn how to use digital technology to edit film and video, compose digital music, perform 3-D modeling and animation, and create digital visual effects. The IT Program offers an opportunity for students to work with professionals in the film industry by producing feature films. Currently the IT Program is producing a third Lucha film called Vengaza Azteca that also stars Mil Mascaras. I am the visual effects supervisor for the film. I am also in early pre-production on a feature film that takes place in the 50’s. It will go into production in summer of 2010. Thrill: Cheers, or should I say, Salud! SONG OF THE DEAD sings in these theaters starting Friday May 8, courtesy of Monogram Releasing. 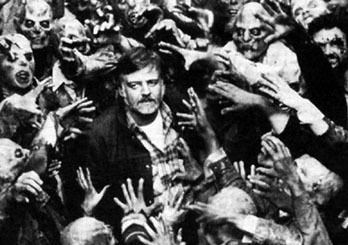 Tagged Chip Gubera, George Romero, Song of the Dead, Zombies. Bookmark the permalink.